When Tim Paul and I did a session on design patterns at the 2015 Service Design in Government conference in London, we expected to get a lively, interested group of UK central and local government people, and we did. We also met people working in government in several other countries – a bonus. Did you spot that government theme? We’re working in government, so a session focused on government was perfect for us. 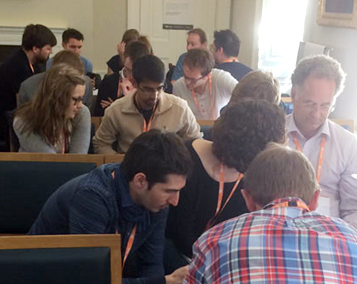 But it was a touch surprising when we got an invitation to repeat the workshop at the 2015 UX Cambridge conference. It attracts a mixture of interaction designers, user researchers, product managers and other folk, probably about half of them based somewhere near Cambridge. It’s a lovely place, but it’s best known for its university, genome campus, science park and technology-focused businesses – and of course, for its local government. Not a lot of central government. w minutes later, and we had indeed got around 30 people. Exciting! A show of hands confirmed our expectation – very few people in the room were working on government services. But they were still interested in our patterns. We had great participation, interesting questions (mostly about accessibility), and attendees said that they enjoyed our ‘have a go’ exercise where they tried applying our design pattern on form structure to a start page that our colleagues at the Home Office are thinking about redesigning: apply for a UK visa. If you’d like to join in, we welcome contributions to our design patterns hackpad. Francis Rowland did a sketchnote of our design patterns session. Next Next post: My new favourite form. Really.